How to Gain the Trust of Google to Rank Higher? Do you know how trustworthy is your website in Google’s eye? All that Google needs, is for the people to find out whatever they need, easily and quietly. It makes use of a series of algorithms and also trust metrics to decide on the sites that will deliver the information that the searcher requires to fulfill the request that they have made. 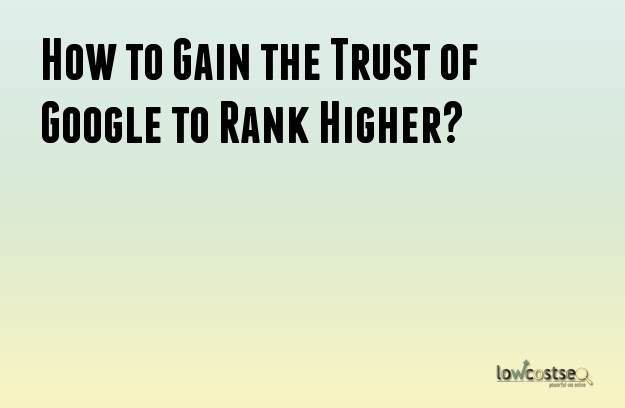 Here are few tips to help you increase Google trust. Google always focuses on importance of having original content for your website. The content should provide a detailed description especially if it is tutorial. A content that does not explain the details isn’t good enough. Moreover, it should be not be copied and should be original. The articles that are written should be clear, well-written and to the point. It should contain some images and videos. However, you need to make sure whether you have the right to use these images or not. Link it to other different contents of the website. In case you feel that you need to substantiate your point then link it to external sources. You might receive some mails from link building companies requesting to add the client link to the website and in return they promise to pay you a monthly fee. This is a violation of the quality guidelines of Google and comes under the paid link scheme. This is because, the websites are not related to the content of your own website and you are providing a link to them without the merit of the editorial. Although they make sense, yet the company requests you to place all these links on the home page which isn’t advisable in any way because your website loses importance in cases like this. It is true that website owners need to find out a way to earn some money from their website. This does not mean that you should compromise on the experience of the user. There are some website owners who are not aware of this fact and they decorate the website with advertisements that are annoying and thus scare away the users. A common aspect of measurement is the bounce rate. If your bounce rate and your ad rate are high then it means that the advertisements are having an effect on the website. Some of the advertisements also slows down the website and creates confusion in the visitor from distinguishing the content from the advertisement. It is very disappointing when you visit a website and do not find information like who is in charge of the website, the name of the owner, and the phone number, or any other contact information. These are factors that help in building up a quality website. High quality content isn’t enough in building a quality website. You need to gain the trust of the visitors. Add information about yourself and provide all contact details and also protect the privacy of the user. Make sure that you add some real testimonials in your website.